Waymo, the self-driving car spinoff of Google, made a big splash last week by announcing it struck a deal with Fiat Chrysler to add 62,000 Chrysler Pacficia hybrid minivans to its upcoming fleet of autonomous taxis. Turns out, the move could have a big impact not only on Waymo’s bottom line but also potential buyers of electric cars in years to come, too. It appears that nothing’s stopping the company from seeking as much as $465 million in federal tax credits as a result of the order, according to experts who spoke to Jalopnik. 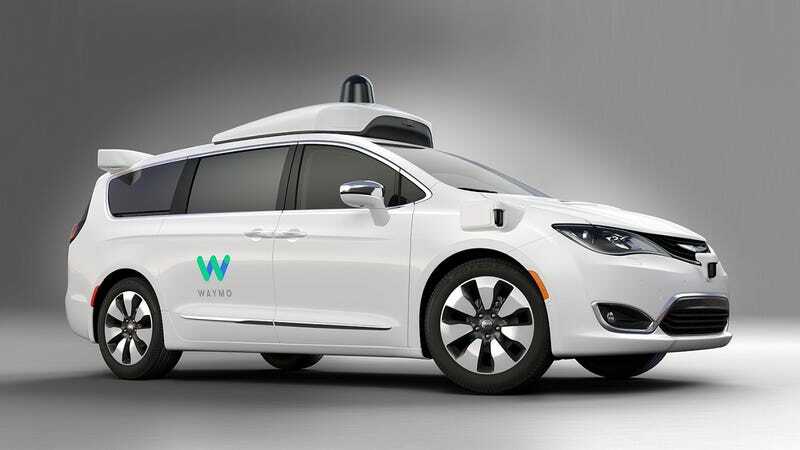 Even if Waymo decides against claiming the electric vehicle tax credit—worth up to $7,500 per car—on its annual returns, the Pacifica order will impact the ability of future car buyers to purchase a FCA electric or hybrid model at a more affordable price, experts said. The Pacifica order represents more than 30 percent of the 200,000 vehicle cap set under federal regulators for the tax credit; once a manufacturer hits that ceiling, the credit begins to phase out. It’s not as if FCA doesn’t have plans in the works for electrified models. On Friday, the automaker announced an ambitious $10.5 billion plan that included a fleet of mild hybrid, hybrid, plug-in hybrids, and pure electric vehicles across 30 nameplates. And until now, the automaker has been situated well below that threshold. “Vehicle sales would apply to the 200,000 cap, which I believe Chrysler FCA is still well under at the moment given their limited PEV sales in the US,” said John Gartner, senior research director at Navigant, a research firm that studies the auto industry. Nevertheless, electric vehicle boosters didn’t shy away from the possibility that Waymo’s purchase could impede future car buyers from taking advantage of the tax credit. “The 30D credit is available to individuals and businesses, and the process to receive the credit is the same via annual tax return, as you indicated,” said Genevieve Cullen, president of the Electric Drive Transportation Association, a Washington D.C.-based trade group. Waymo’s announcement had a caveat, that it plans to add “up to” 62,000 Pacificas over a three year period. If it adds that many Chrysler hybrid minivans to its fleet, and secures a $7,500 credit for each, that means it’s potentially eligible for $465 million in federal tax credits in total. A Waymo spokesperson had no comment. FCA declined to comment on the prospect. FCA’s website notes the Pacifica qualifies for the $7,500 tax credit, but there’s a number of moving parts to claiming it. Under IRS regulations, the vehicle has to be propelled “to a significant extent” by an electric motor with a battery capacity of at least 5 kWh, and it has to be recharged using an external source of electricity. Plug-ins, like the Pacifica, quality; cars with a traditional hybrid powertrain, like the Toyota Prius, don’t. And it’ll only cover what the taxpayer owes for the year, so if Waymo owed $10 million next year, it could only deduct $10 million from the EV tax credit. Unlike California, which reined its own tax rebate a few years back for wealthy buyers, there’s no income cap for the federal EV credit, and that includes corporations. “Corporations or individuals can receive the credits; only government agencies are not eligible,” said Navigant’s Gartner. “Based on this language we assume that Waymo is eligible,” Acevado told Jalopnik. And even if Waymo doesn’t claim the rebate, the sales would still apply to FCA’s 200,000 cap for the $7,500 credit, meaning fewer car buyer would be able to qualify down the line. “With these types of blanket policies, it makes some sense that different automakers would take wildly different routes to expanding their plug-in sales. GM has focused primarily on mass market compacts while Tesla has filled the majority of their rebates with premium luxury vehicles, and now FCA has entered a high profile partnership that might represent the public’s first autonomous, electric on-road experience,” Acevado said. Brian Moody, executive editor of Autotrader, said Waymo’s eligibility for the credit represents a “very complex question” and pointed to the IRS regulations to illustrate why it could be complicated. “There are many variables such as the profit or loss of the business and the type of business it is,” he said. Waymo isn’t believed to be generating any revenue, as it continues testing a fleet of autonomous Pacificas ahead of its expected autonomous taxi service in the Phoenix area later this year. In that sense, it’s almost certain the company would have a tax liability in the near-future. Waymo and FCA’s announcement offered few specifics on when the expanded fleet of Pacificas would be deployed on public roads, only saying “up to 62,000" will be made “over the next three years.” FCA said on Friday that it’s in the early stages of discussions with Waymo to sell fully autonomous cars for regular customers. There isn’t a limit to the number of vehicles it could seek a rebate on. “There is no distinction on whether the taxpayer is an individual or corporation so no limit on the number of purchases for either,” Cullen, of the electric drive train association, said. Still, sales of plug-in vehicles remain slim as can be. Acevado saw a silver lining, however.